Below are reactions from politicians, tech leaders and friends. Brave enough to think differently, bold enough to believe he could change the world, and talented enough to do it. "Michelle and I are saddened to learn of the passing of Steve Jobs. Steve was among the greatest of American innovators – brave enough to think differently, bold enough to believe he could change the world, and talented enough to do it. The world has lost a visionary. And there may be no greater tribute to Steve’s success than the fact that much of the world learned of his passing on a device he invented. Michelle and I send our thoughts and prayers to Steve’s wife Laurene, his family, and all those who loved him." "We are deeply saddened to announce that Steve Jobs passed away today. His greatest love was for his wife, Laurene, and his family. Our hearts go out to them and to all who were touched by his extraordinary gifts." Steve has touched through his work.Steve and I first met nearly 30 years ago, and have been colleagues, competitors and friends over the course of more than half our lives.The world rarely sees someone who has had the profound impact Steve has had, the effects of which will be felt for many generations to come. For those of us lucky enough to get to work with him, it’s been an insanely great honor. I will miss Steve immensely." "From the earliest days of Google, whenever Larry and I sought inspiration for vision and leadership, we needed to look no farther than Cupertino. Steve, your passion for excellence is felt by anyone who has ever touched an Apple product (including the macbook I am writing this on right now). And I have witnessed it in person the few times we have met. On behalf of all of us at Google and more broadly in technology, you will be missed very much. My condolences to family, friends, and colleagues at Apple." "People sometimes have goals in life. Steve Jobs exceeded every goal he ever set for himself." "Tonight, America lost a genius who will be remembered with Edison and Einstein, and whose ideas will shape the world for generations to come. Again and again over the last four decades, Steve Jobs saw the future and brought it to life long before most people could even see the horizon. And Steve’s passionate belief in the power of technology to transform the way we live brought us more than smart phones and iPads: it brought knowledge and power that is reshaping the face of civilization. In New York City’s government, everyone from street construction inspectors to NYPD detectives have harnessed Apple’s products to do their jobs more efficiently and intuitively. Tonight our City – a city that has always had such respect and admiration for creative genius – joins with people around the planet in remembering a great man and keeping Laurene and the rest of the Jobs family in our thoughts and prayers." Steve was a teacher to anyone paying attention. "The magic of Steve was that while others simply accepted the status quo, he saw the true potential in everything he touched and never compromised on that vision." "Despite all he accomplished, it feels like he was just getting started. With his passing the world has lost a rare original, Disney has lost a member of our family, and I have lost a great friend." "We have lost an American hero. Steve Jobs is irreplaceable, but he will inspire people for generations – to innovate, to tackle great challenges, to do what you love, to change the world. My thoughts and prayers are with his family and loved ones." "Samsung Electronics is saddened to hear of Chairman Steve Jobs’ passing and would like to extend our deepest condolences. His innovative spirit and remarkable accomplishments will forever be remembered by people around the world. We would like to again express our sincerest condolences to Mr. Jobs’ family and his colleagues." Great man, Steve Paul Jobs, a true intellectual. What about Tim Cook? did he say anything? Yes, I've included his statement as well. We'll keep on updating the page as more people share their feelings and thoughts. @ Firedrops. 1. Products Apple has released this year have been incremental upgrades, and they have said as much. 2. Building up hype is just part of doing business. Whether or not they believe the product is going to be revolutionary, they're going to try to convince the customers that it is. 3. Steve Jobs died of natural causes. They did not set the date for an event that takes tons of planning around a prediction of the exact day that Steve Jobs would pass away. 4. You think problems/kinks with such a device can be ironed out in a week? Moreover, you think that they would just give up with less than a week to go? Your comment is a mess of misinformation and lack of understanding of how businesses operate. If you are going to be a conspiracy theorist, at least try to employ some logic. A great man, a genius, an innovator and leader. You don't have to own an Apple product to recognize the impact this giant had. We're all a little poorer without him. I'm typing this on an Android phone, fully aware that without his vision, this device would look radically different. It's a true shame anyone has to die of such a miserable disease, but seems a tragic waste for someone of his stature, almost like he should have died more heroically. Condolences to his family and friends. Take some small comfort in knowing how much he changed the world. Yes, sad day indeed...As he was well known for his business sense as much as for his philanthropy achievements. He's the greatest. No Doubt. 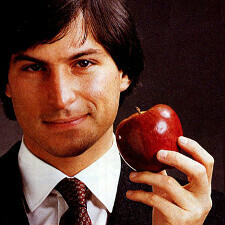 RIP Steve Jobs, all though im in no way a fan of apple, i admire him for taking his ideas in his head and making them function, and best of all make millions appreciate it. It's nice to read some of these statements. One thing I don't get is why commenters keep having to clarify they're not Apple fans. If you want to leave a comment go ahead but no one really cares if you're an Apple fan or not. The guy was preety smart & sharp. We must accept it! Truly is sad. Hands down, he was a visionary. Never was a big Apple fan, and sold against them for years. However, with that being said, I respected Steve Jobs highly. The way he innovated the music, internet, and phone industry is unmeasurable. He was truly a genius, and as a programmer/inventor myself, I can only hope to do something as great as Steve Jobs. He will be missed. I'm deeply saddened by this news. St eve my buddy is gone!!!!!!!!!! I'll greatly miss you. I've never owned any of your products. But surely they were all great products with exceptional quality. Wish I could get me a macbook pro 17'' for $500 bucks. I'll miss you Steve. MY DEEPEST AND MOST SINCERE CONDOLENCE TO YOUR FAMILY AND LOVED ONES!!! MAY YOU REST IN THE BOSOM OF OUR LORD JESUS CHRIST!!! AMEN!!! Millions of people better than Steve Jobs have died and nobody cared. Apple is a fashion brand like Prada. Apple did not "innovate", they simply made their own versions of technology already invented by other people, and people bought the Apple branded stuff because of the Apple name. What was Apple first at? What about the Commodore PET, Xerox PARC and Alto, GEOS graphical user interface, Amiga, Atari ST, Diamond Rio MP3 player, Palm Pilot, Blackberry, HP iPaq, Microsoft Tablet PC, etc., etc., etc.? Steve Jobs was not an engineer and did not even know how to write a computer program. Where was his genius? Apple fired him in 1985 because he was such a jerk and a bad businessman. Even Apple products were not created by Steve Jobs, but by actual engineers such as Steve Wozniak, who Steve Jobs stabbed in the back. whoa..."Pirates of Silicone Valley" was just a movie man. im pretty sure there are some fictional parts to it. It's funny to see that Jobs was re-hired to Apple, probably because he was good at being a "jerk and bad businessman" I agree that there were many people who have died that deserved recognition, but you're mad bc when they died, they did not get flowers, apples, cards and sticky notes in memory of them? my friend, you are SMOKING CRACK if you believe Apple didn't innovate anything. either that or you do not know the definition of "Innovation"